The RECOVERALL command lets you repair a drawing that has XREFs and it will fix the XREFs as well. As long as the XREFs were pathed correctly the last time the file was in functional order this command will audit them as well. Wait for it to process the drawing. When it is finished, it will show a mini report of how many errors it found and fixed and if it deleted anything. If this does not work try opening a new blank drawing and inserting the corrupted drawing as a block into the new blank drawing. From there you can explode the block and run the AUDIT command. The idea can be applied by inserting the drawing into a blank drawing as an XREF and then binding to the drawing. From there you can run the AUDIT command. This method would also need to layer clean up as well.. This entry was posted in Manage, TIPS, XREFs. Bookmark the permalink. Note: If a drawing with an RText object is opened on a computer that does not have RTEXT installed, the proxy object that results displays the bounding box of the RText object. If you plan to send your drawing to someone who does not have RTEXT, you can explode the RText objects to MText objects with the EXPLODE command. 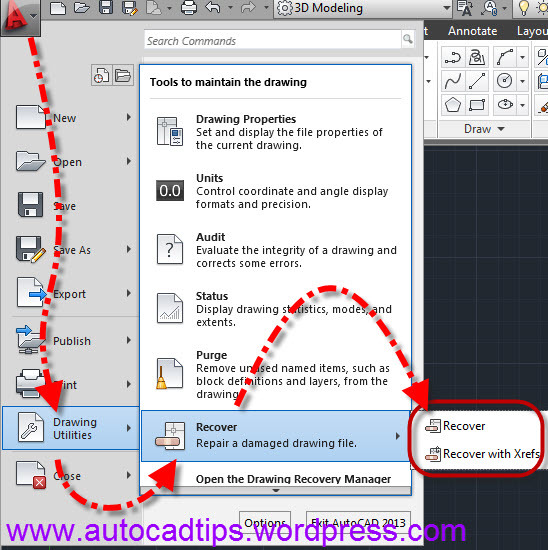 You can recover autocad autosave file by this way, because autocad save dwg file automatically. Step 1. Go to the folder C:\Users\[User Name]\appdata\local\temp\ and find the file with *.ac$ as extension.